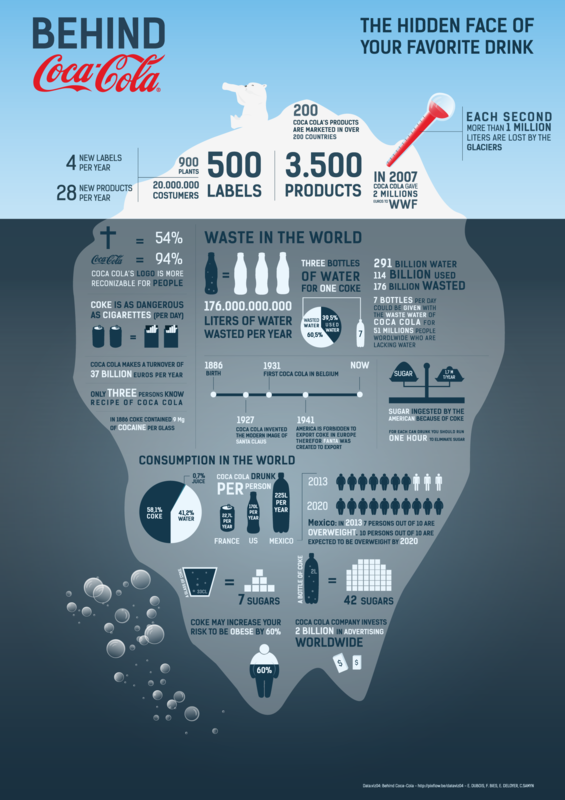 Do you consider the hidden environmental footprint when your buy and drink Coca-Cola, or any other similar carbonated soft drinks? Yeah, probably not! The infographic below shows some of these hidden environmental costs and health issues that comes with drinking carbonated soft drinks. For example: While drinkable and clean fresh water is a precious natural resource it takes three bottles of water to produce one bottle of Coca-Cola. It's important that we take responsibility for the things we choose to consume. I am going to post this on my bulletin board over my desk. I am working on kicking a killer (literally, if I let it...) soda habit and over the last two or three days found myself falling back into old ways. Coke isn't my poison of choice, but the point is well made and certainly applies to other soda brands as well. I have had the hardest time kicking the soda habit, and I desperately want to. The products offer absolutely nothing of substance or value. They are horrible for our bones and teeth, our waistlines, and our brains. Their production harms the environment significantly, and the plastic bottles are also helping to destroy the environment. Quitting soda is a win-win-win situation for everyone. I'll use this infographic as inspiration for quitting the nasty things in the New Year. Soda is addictive, sugar in general is addictive. Sweets. chocolate have an addictive component. You get sugar cravings. It's been a few years since I hardly eat any sweets, and never drink any sugar soft-drinks.
. I think the key to this is eating lots of fruits. Fruits are rich in natural sugar, and the difference is: a candy bar will give you a sugar high, and then a sugar low, followed by a craving - whereas if you eat 4-5 bananas, you get a natural high, without the low, you feel full of energy and you feel good and healthy. I think this is the key to kicking the soda habit - getting your sugar fix from fruit, and why not, from freshly squeezed fruit juice. Buy a juicer and drink fresh juice. It will help you kick the soda habit in no time. It really is tough, isn't it? I don't know (and probably don't want to know) what it is that is in soda that makes it so addictive, but I swear I had an easier time quitting smoking than I've had kicking my Mt Dew habit. I quit smoking 13 years ago and never looked back but I've never managed to stay away from soda for more than a few months at a stretch. And the first few days of quitting are miserable - I get migraine like headaches from withdrawal, then feel fuzzy and generally wrong for a full week. I've been quit since the first week of December so maybe this is the time that it is for good! I had no idea, how many bad effect soda had. When I was little, my parents wouldn’t let me have soda. My husband is a soda junky. Since, being with him, I drink way too much soda. I want, to go back to not drinking any soda at all. I am having a hard time doing this. I still drink soda. But, I drink more water and tea. I have decided, to do it in little steps. I drink one bottle of water, to one can of soda. By February I hope, to switch out the soda for ice tea or hot tea, all together.